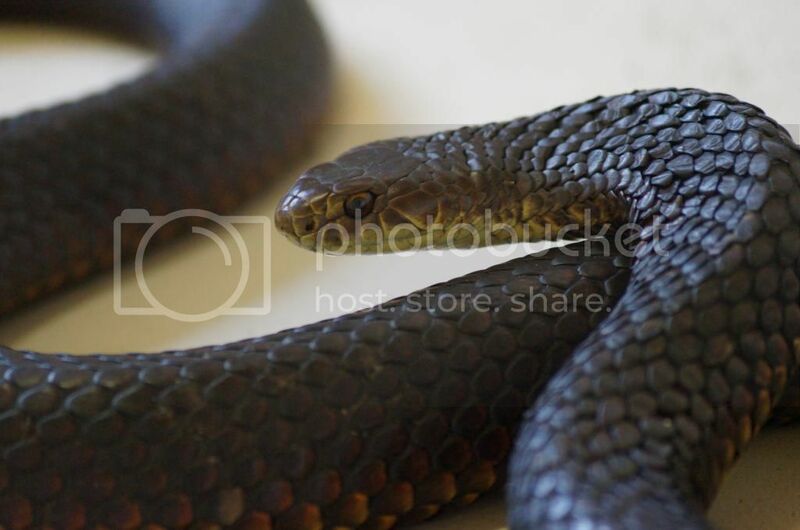 Do Tiger Snakes (on Kangaroo Island, at least) get out & about in cold wet weather? Generally not. Most snakes stay underground when it is cold. They don't mind getting wet (they are generally good swimmers and hunt food in rivers and ponds) but only when it's warm. Some snakes endure colder weather than others. 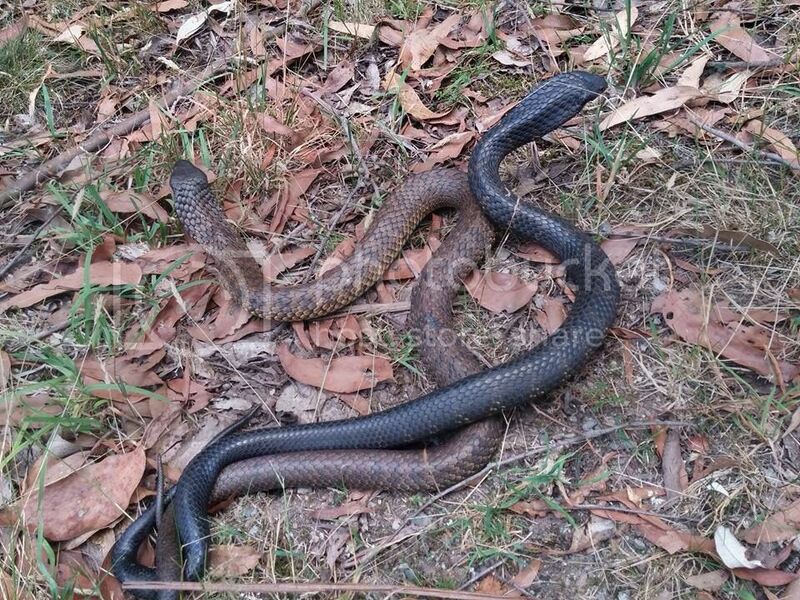 Copperheads will be out in colder weather than tiger snakes will. Sometimes they will surpise you though. 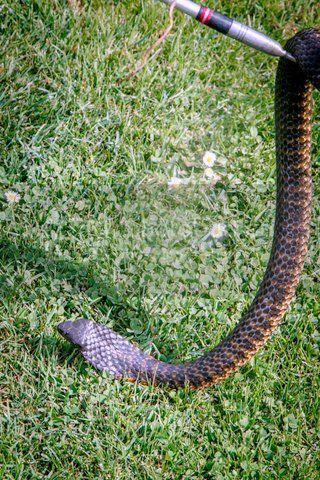 I have a friend who took a photo of a black snake out in Winter. This is quite unusual. As I expected, Soakes, there are exceptions to the rule. In fact, one cold winter's day I heard a rustle in the grass behind me & thought that it might have been a nearby Western Grey Kangaroo so didn't pay much attention. When I finally looked around a Common Brown was almost at my feet. I then paid attention. This snake is obviously not in its natural environment. What is the story here? 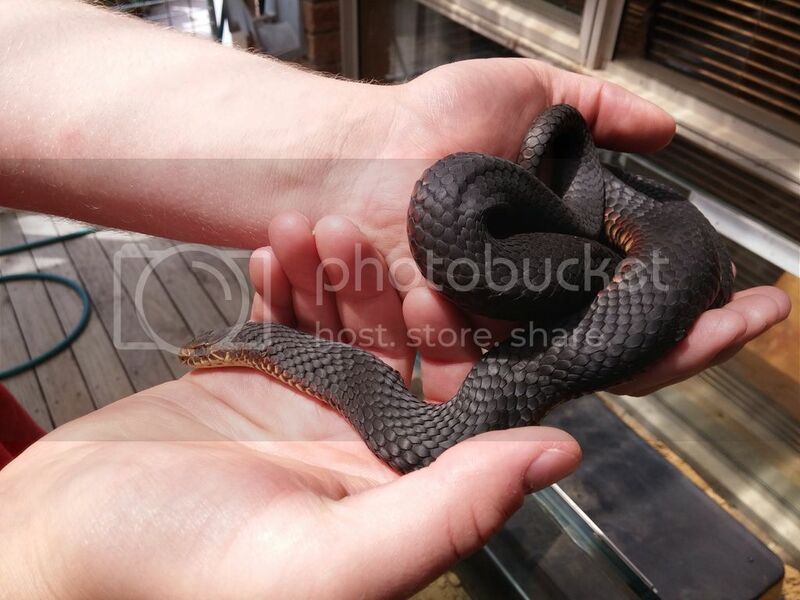 Thanks Soakes, I do Reptile Rescue in Tasmania, and this particular snake was injured in the process of removing from a stormwater pipe. 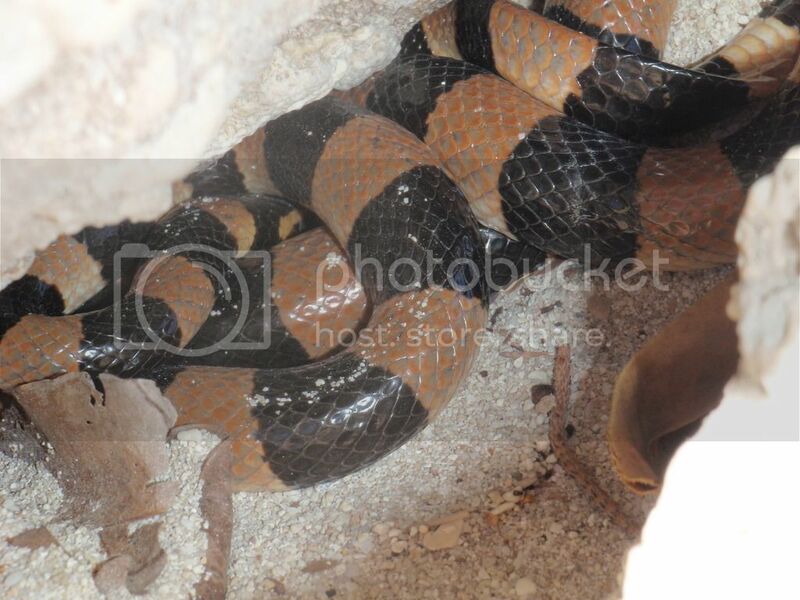 These were taken while assessing the snake prior to release. While it is never my intention to cause injury, it sometimes happens. This snake was kept in care until it's wound healed, sloughed and was successfully fed. It has now been released. We also do reptile awareness and displays, and as such have several specimens in captivity for this purpose. Snakes don't need to eat every day, we try and feed every few weeks, any specimen which will not take feed, is released as close to where it was removed from originally as possible. We also allow them to go into Torpor over the winter months. In Tasmania it is a requirement to have a "Herpetology Permit", to collect and keep specimens in captivity. It is currently illegal to keep non indigenous species in Tasmania. With the weather starting to improve, my "snake season" is kicking off. We do Reptile Rescue in our area for Reptile Rescue Inc., a not for profit charity. 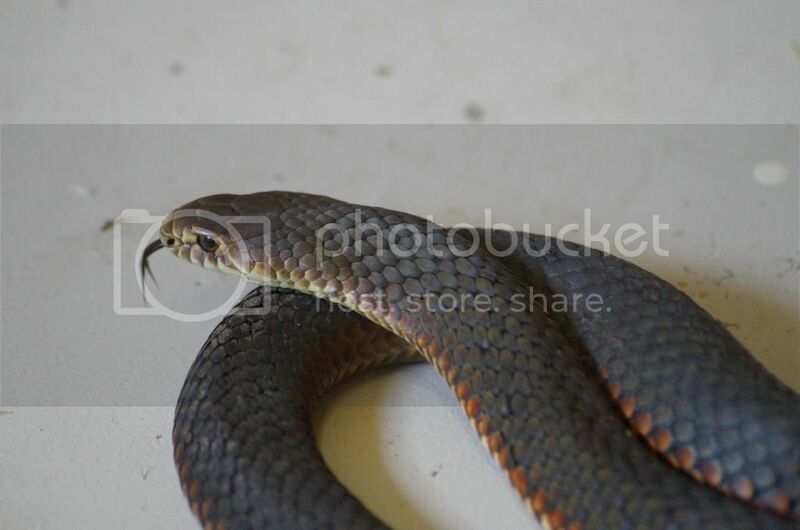 Today's little pretty, approx 90cm Tiger Snake (notechus scutata). Photos courtesy of the client, and posted with permission. Hi shorty, love your photos and YouTube video. For those who don't know, the video will be of 2 males, establishing dominance to win the female. You were lucky to capture this behaviour, and as always your photos are brilliant. 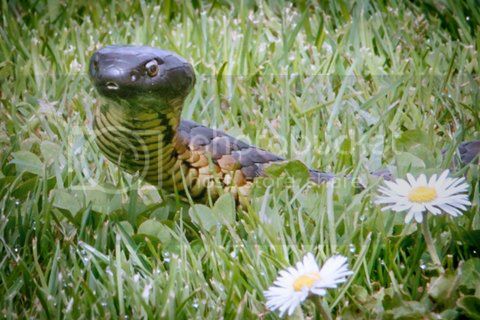 Thanks for sharing, I love snakes as much as I love birds! Yes the female was present at the beginning but moved on while this happened. 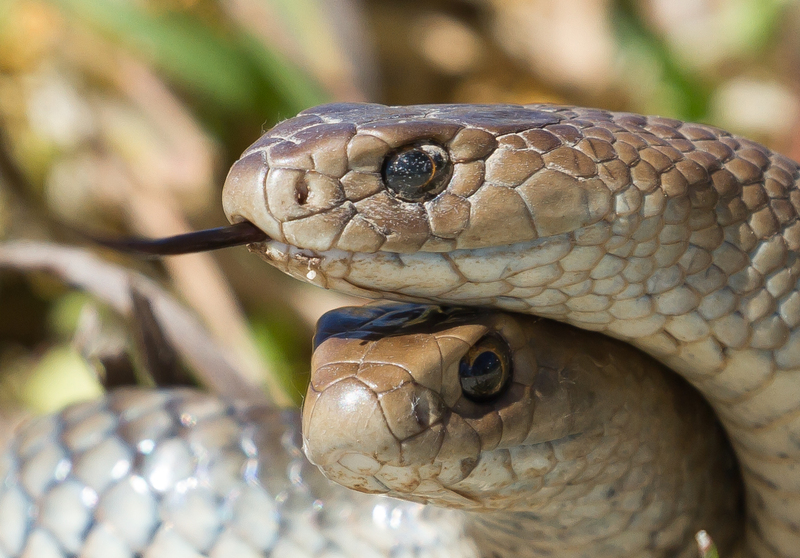 The 2 males continued for over an hour and yes i do feel very lucky to have witnessed such behaviour, i too love snakes as much ( if not more ) than birds. It is isn't it Woko, shame we interfere so much in nature. Live and learn. Magic shots Shorty, love snakes as well. Saw my first for the warmer year today. Hi Woko, only just noticed this question. I live in the cold Yarra Valley.. I haven't seen any snakes yet this year, but I know someone who has seen a copperhead. I guess they will be out this weekend, as the weather in Victoria is expected to be warm! Thanks, Rick and Vas. I downloaded video software today and quickly put together the 5 short videos i took and uploaded them together. Excellent work Shorty, very interesting behaviour. Hope someone can help with an ID on this snake from Gluepot Reserve. No expert but snakes vary in colour depending on location and time of year. I'm thinking maybe a Tiger? But wait for someone with more knowledge on snakes to come along. 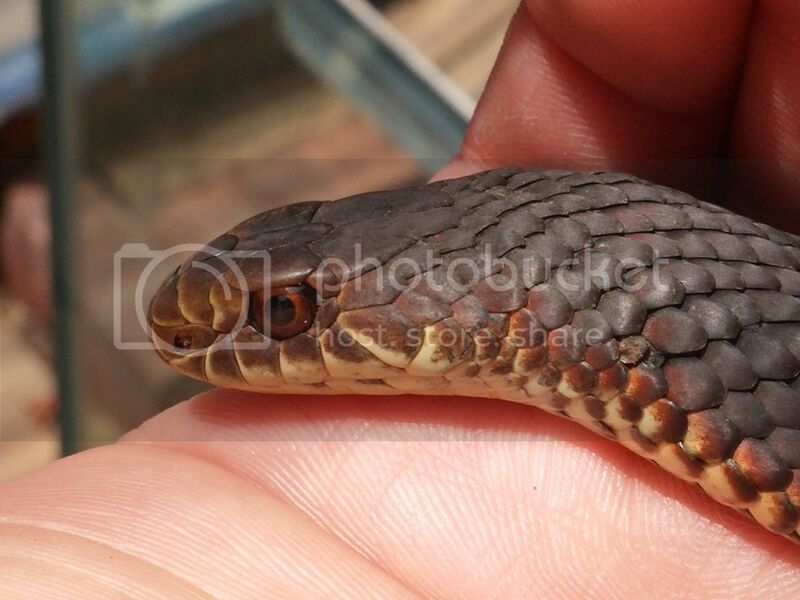 It's not one I'm familiar with, but I am guessing that it might be a "Mitchell’s Short-tailed Snake". Looks like the colour of Mitchells but is much longer than the 500mm average quoted. This snake was over 1m long. In that case it is more likely a tiger, but the website I looked at listing snakes in the region did not include tiger snake (which seems odd). It is also possibly a king brown. You would need a closer look at its head / behaviour to help identify it. This is the only shot I have of the head more close up. OOF but still shows some detail. If you look at the link below for head scale shapes, I suggest a Copperhead. We only have Lowland (austrelaps superbus) , but not entirely sure, unfamiliar with mainland species. Don't believe it is a tiger, the central scale between the eyes is too long. I also note the smoothish line along the side where the colour lightens, Tigers usually have an almost saw tooth appearance. As always happy to be wrong. I also note that Lowland Copperhead has an average length of only 70cm in South Aus., we regularly see them at 1 metre and up to 1.5 metres is not unusual. 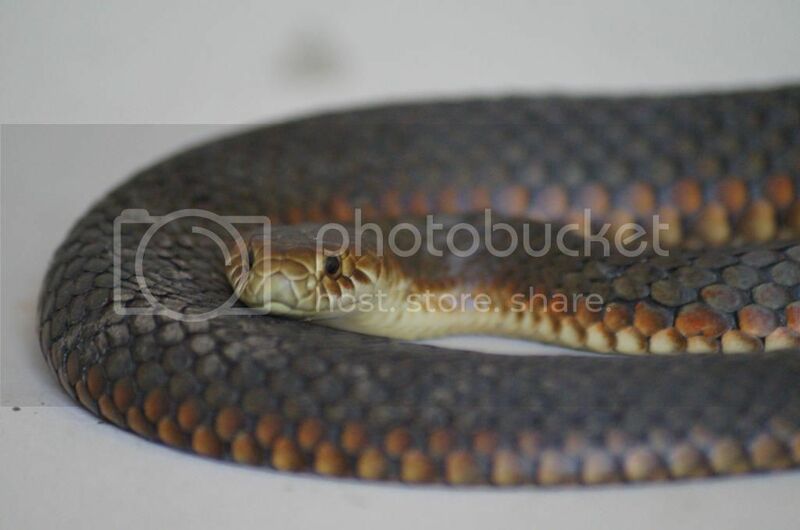 Not sure if you have the Highland Copperhead (austrelaps ramsyi). Colour is never a good guide to identify snakes with, our tigers vary so much from white/grey through to all black. For comparison to Rick's snake. here is a Tiger i rescued last year, shows the head scale shape, note the shorter, wider "shield" shaped scale in between the eyes. This is a Tasmanian Tiger notechus scutata.I beleive Tigers of all species have this shaped head scale. This guy was only about 750mm long, and while it looks as if his neck is squashed, no harm was done in capture. I use this device if I need to gain control of the head when assessing other wounds found. Gosh, i've really loved seeing all these photos! dwatsonbb, you have such a great job! This is something i'd love to do one day. Taken off my verandah this afternoon. Soaking up all that lovely warm sun. Not sure who was most afraid me or him. ..high shutter speed to stop the camera shakes blurring the shot too much! And, pray tell, what species is that , Reflex? Woko, it looks like a Green Tree Snake. 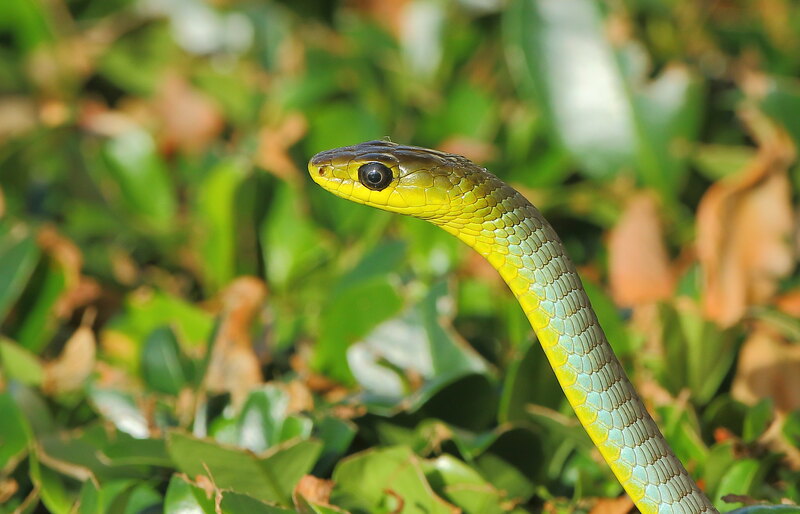 A beautiful snake and great photos of it! That's correct Tim. 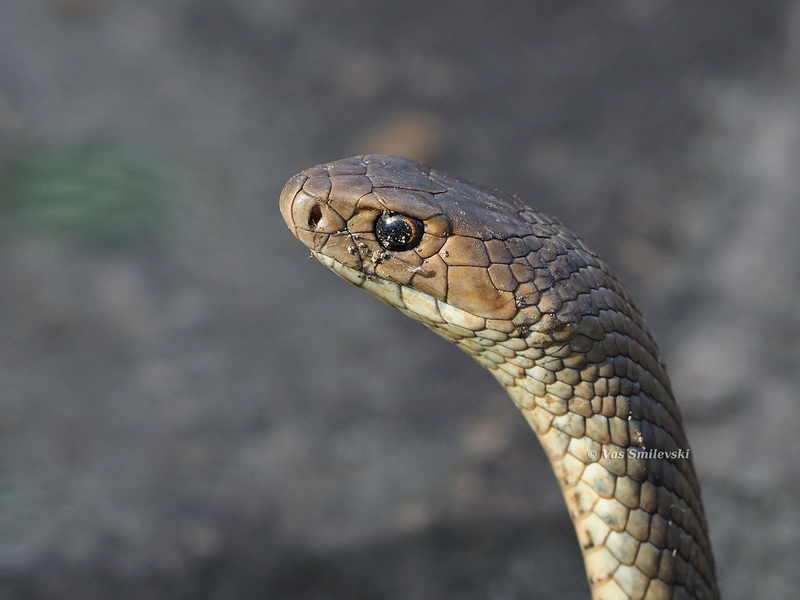 Other common names are Yellow-bellied Black Snake and Grass Snake. Wide range of habitats from the periphery of rainforest, wet sclerophyll forests, dry woodland, farmland, and suburban backyards and gardens throughout the region. In fact common & widespread throughout Brisbane and non-venomous. Probably the most common species to enter homes. Generally above ground environs such as heavy foliage of trees and shrubs, exposed beams of verandahs and pergolas, sheds and garages. Fast-moving and hard to see in heavy cover. Have exploited the abundant supply of Asian house Geckoes, high densities of skinks and presence of frogs in continually watered localities associated with suburban environments thus accounting for there frequency around homes. Thanks for all the information, Timothy & Reflex. A very nice looking animal with an important role in the ecology by the sound of it. Wow, that is awesome Dale! I didn't know they came on land to digest their meal. 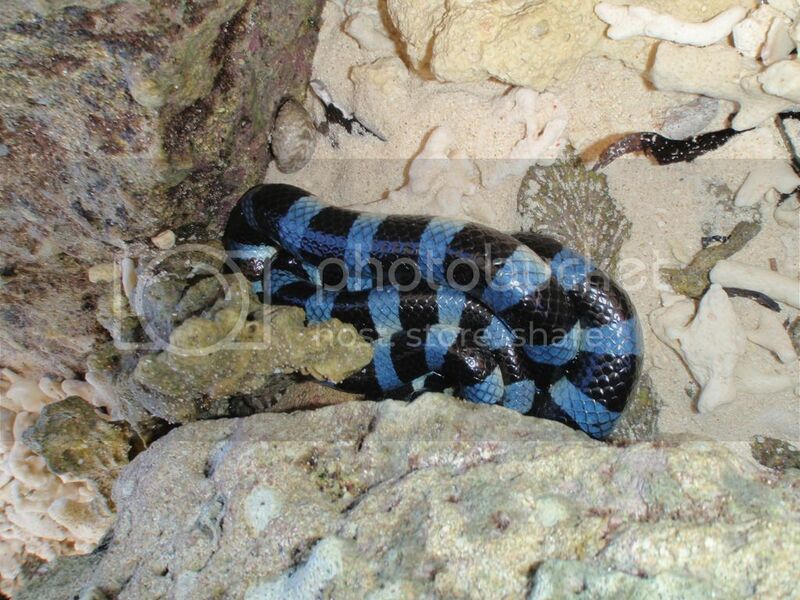 I think I saw the black and orange barred snake a few years ago on a trip to Vanuatu. They're beautiful snakes, even though they are venomous. The blue one is simply stunning and I would love to see one. Very interesting and beautiful snakes there Dale. 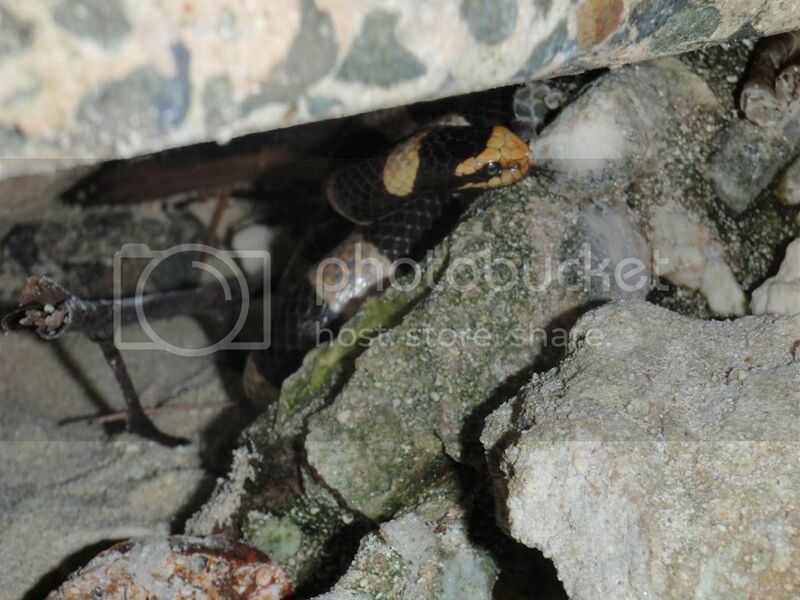 The only sea snake I've seen in the past is the Yellow-bellied sea snake (which was more black and orange, and a fair bit stumpier than these guys) on the beach at Port Stephens as a young fella. I was ready to throw it back in, when Dad advised against it. Luckily, as it turns out, because we found out how venomous they are after that. Thanks all, the venom on these guys is much more potent than a King Cobra, however they have a very small mouth, and the venom is delivered via teeth in the back of the mouth. They would find it difficult to bite an adult human. 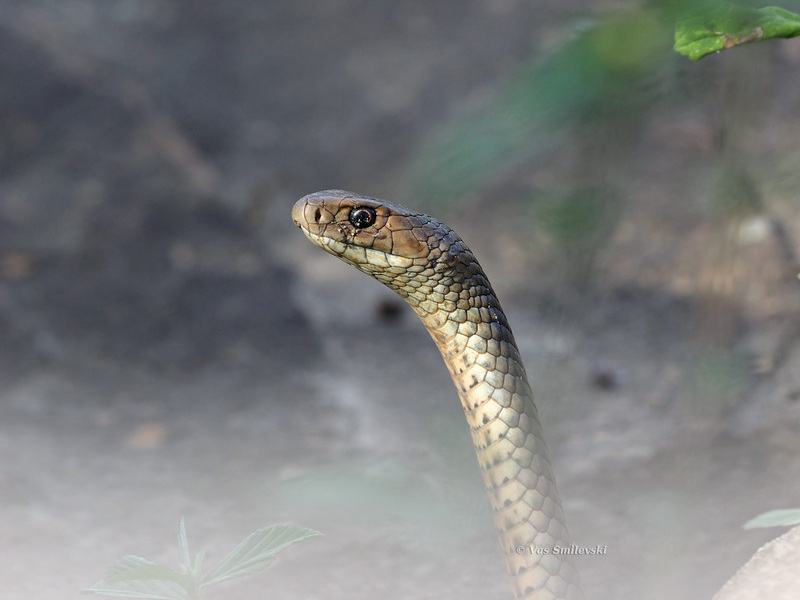 They, like most snakes, are shy and retiring, looking always for an opportunity to escape. There is no anti-venom available, however it is believed a poly-valent (used when the exact species is not known, or there is no species specific anti-venom) anti-venom should be effective. 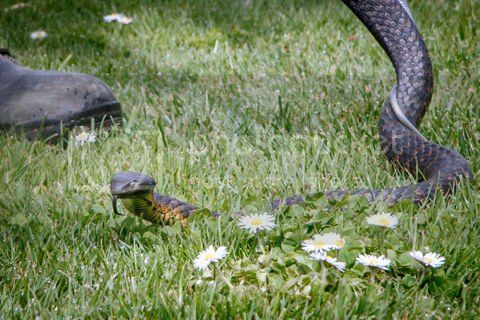 As some of you know, my son and I do Reptile Rescue here in Tasmania. So far our season has been very busy. Last year I relocated some 40 snakes between July and March, this year I have 30 from September until yesterday. The first 2 are Nelson, a young adult Lowland Copperhead - austrelaps superbus caught near the entrance of a busy restaurant. He is very placid, not at all like a normal copperhead (they usually get extremely active in a "defensive" manner, flapping around). Nelson is so placid he will remain with us for the purpose of Reptile Rescue Inc. awareness programs and displays. The second is of a beautiful coloured Tasmanian Tiger - notechus scutatus, who will also become a star of our awareness programs. Coincidently both snakes were found with a kilometre of each other and less the 5 kilometres from the Hobart GPO. Snapped this Common Brown Snake yesterday in water overflow from a tank at my place on the s.e. slopes of the Mt Lofty Ranges in SA. The weather was ideally warm for snakes & lizards. Sam (my son) and I got called to remove a snake from a residence tonight. When we arrived, it had disappeared into a rock wall. 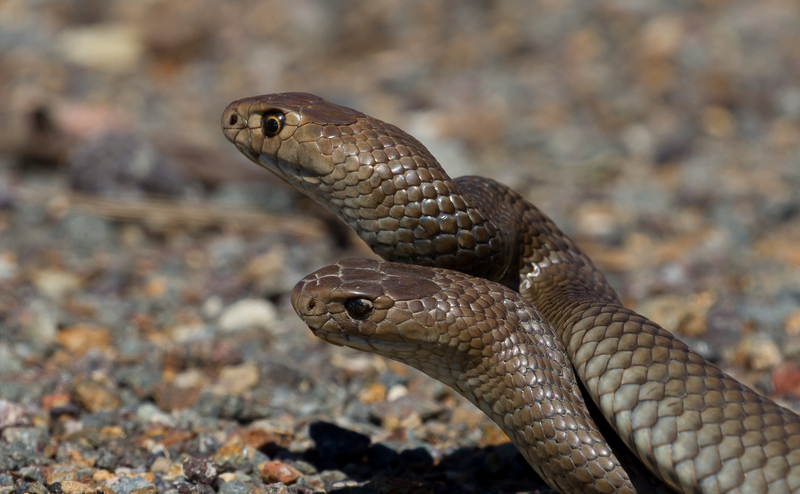 We dismantled a small section of the wall, and found not 1 but 2 lovely Tasmanian Tiger Snakes (notechus scutatus). This photo taken by Sam on his phone, keep forgetting to take the camera! Reasonably confident we have a boy and a girl. Just shows some of the colour variation as well. Photo taken on release, away from possible human contact (hopefully). I notice a flattening of the back of the head. 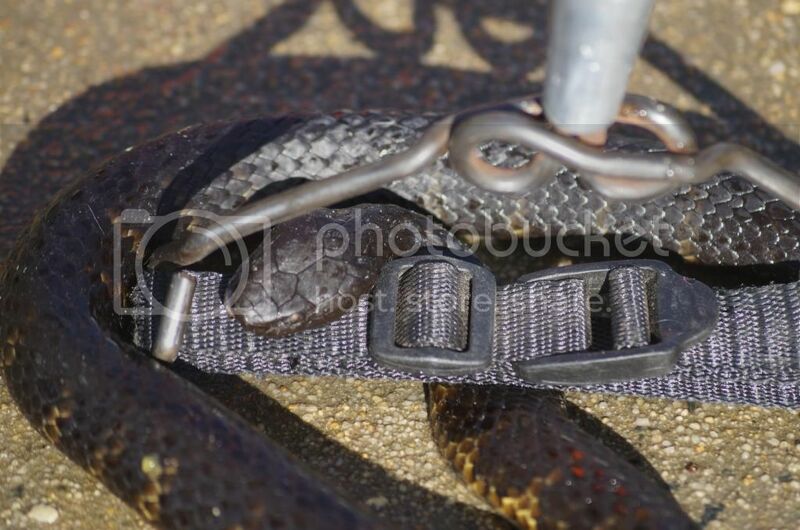 Is this common to all Tiger Snakes, Dale? Or is it an alarm signal? I saw a medium-sized tiger snake today (in Gippsland), but was unable to get a decent photo since I only had my phone with me. It also was flattening its neck - I think to maximise the sun it got. Does that sound likely? On the other hand it might have been aware that I was there and was reacting to my presence. 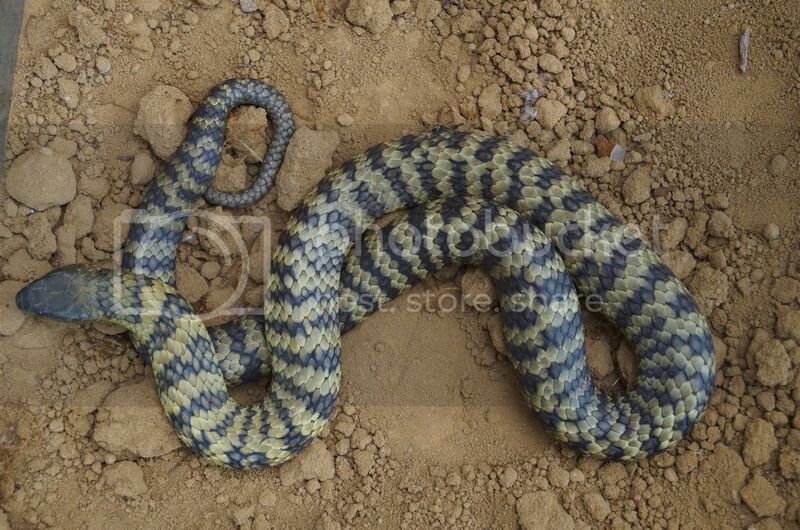 Thanks soakes, snakes will often "flatten" in order to maximise the surface area exposed to the sun. It is their way of getting warm as quickly as possible. This is usually an almost total body flattening, not just the neck and usually with the head on the ground. There are always exceptions to most rules. I can really only offer opinions on Tasmanian species, but will never claim to be an expert. 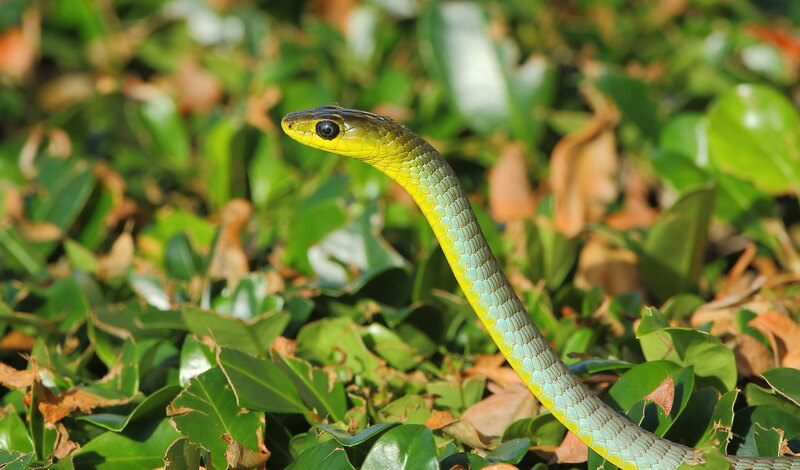 If the snake you saw had only neck flattening, then it is possibly in a defensive posture, due to your presence. I have seen defensive posturing, without raising the head, but not often. 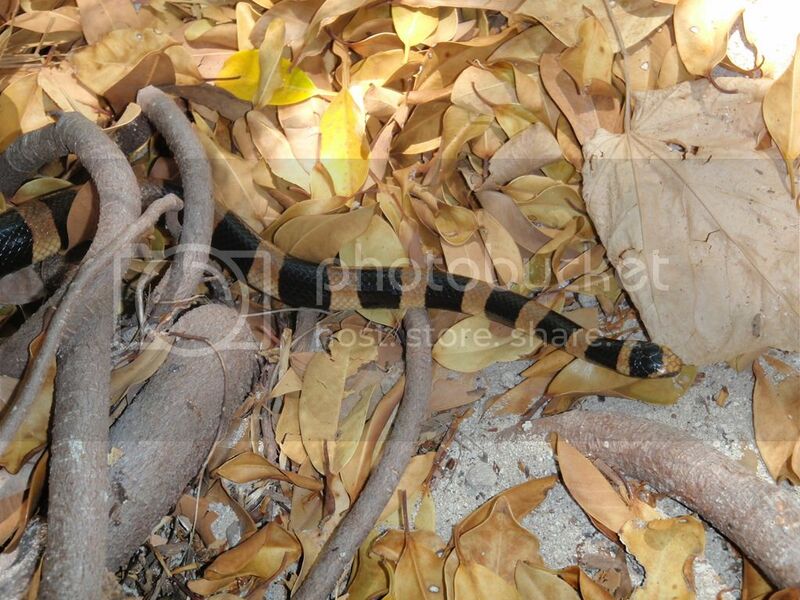 Nice shots Vas, unfortunately I don't get to see snakes often.